A Right Way and a Wrong Way to Do Coffee and Donuts « Midlife Crisis Crossover! Three fine ways to kick off a Saturday morning before a shopping spree. Behold my Saturday morning sugary wake-up call from Hilligoss Bakery, a local establishment in the nearby town of Brownsburg since 1974. 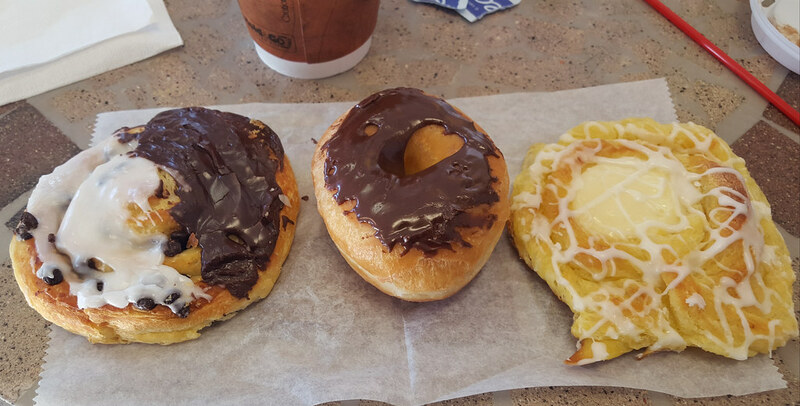 They relocated several years ago to a standalone building that once housed a frozen custard joint, but have made the place their own with an exemplary array of donuts and danishes, as well as fast and reliable customer service. They sell a limited selection of drinks on the side, including a couple of different varieties of freshly brewed coffee — nothing fancy, no aspirations to double as an artisan coffeehouse, but they keep it brewing steadily for not-so-finicky coffee drinkers like me. They’re pastry purveyors non pareil located fifteen minutes from our house, but in a direction we rarely find reason to travel, so we’re not quite regular customers (yet). We do recommend them to anyone with an excuse to be in the vicinity. This morning I made the command decision to go out of our way toward their vicinity. To be honest, Hilligoss wasn’t our first stop, but our day had started off on the wrong foot and I knew they’d set it right. As previously griped, I missed this year’s Black Friday altogether and saw the rest of my Thanksgiving weekend divvied into piecemeal chunks that left me not nearly enough time to get a handle on my in-person Christmas shopping. After a subsequent, lousy work week in which my one sick day was arguably the lone highlight, I was looking forward to offsetting last weekend’s losses with a nice round of accomplishments. Step one: breakfast. Partly as a nod to the equally missed Small Business Saturday and partly as a dose of Something Different, I had the idea of checking out a new bakery that opened this past summer in a tiny strip mall five minutes from home. I only recently learned about them through Nextdoor, a social media app in which users can chat online with strangers who happen to be their neighbors. Based on what I’ve seen of Nextdoor, folks in our area chiefly focus on lost pets and one Mexican restaurant that’s either awesome or trash depending on which side you believe, but one welcome digression informed me we now had a potential donut alternative to Dunkin. We unfortunately live on one of the wrong sides of Indianapolis and have an extremely limited selection of convenient crafty cuisine. Whenever some entrepreneur blesses us with their presence, I get really excited. And every so often, I’ll get really let down. Such was our first experience at the new place. Our initial problem happened from Day One well before we arrived: they don’t open Saturdays till 9 a.m. We prefer an earlier start to our weekends so we can eliminate our errands and have more time left over for fun. Your average shop announces “time to make the donuts!” well before the crack of drawn, while the rooster is still slumbering and dreaming about chickenfeed. We pulled up at 9:05, the same time as another young lady. We let her go first as a kindness…only to realize we had to let her go first because she was the only employee on the premises. She unlocked the door, let us in behind her, and began turning on the lights while we perused their shelves. As a twelve-year veteran of the restaurant biz, I cannot stress enough how critical it is to have your crew on site and prepping food well before opening. That’s how food service works. The location is cramped and old, having housed a ministry and a childcare service in its past lives. Its few walls were lined with prepackaged snacks and knickknacks for sale apparently obtained from other random vendors. The small public floorspace, which Anne and I couldn’t navigate without bumping into each other, could only fit three tables, one of which was occupied by a large business printer. A cooler offered a limited selection of drinks including about a dozen canned Coke products (no Diet or no Coke Zero) and one (1) Starbucks Frappuccino, pumpkin spice-flavored. One urn for hot water, for hot chocolate and probably tea, had just been plugged in upon our arrival. An ice cream cabinet had some treats buried under a big bag filled with…I couldn’t tell what kind of objects, but I don’t think they were ice cream. And then there were the baked goods…what few there were. A few mini pecan pies, a box or two of small scones, several small loaves of pumpkin bread, couple of waffles, a bowl of chocolate muffins. Not much else, and all of them were leftovers. Possibly from yesterday, possibly from other yesterdays. Most disappointingly: zero donuts, despite the use of the word “donuts” on their website. We wiped any hope of “fresh baked” from our expectations in that moment. We didn’t bother to ask about the “breakfast and lunch menu” likewise touted on their site, as we saw no viable menu posted, only a chalkboard listing some of the custom cake flavors they’ll make and decorate for you for special occasions. The one (1) cake on display showed promise, but we weren’t scouting for birthday cake. While pondering our narrow options, Anne asked on my behalf about their coffee. The nice young lady, who’d finally turned on all the lights so we didn’t feel trapped in a spooky shack, informed us the coffee wasn’t warmed up yet. Not “brewed”. Warmed up. In other words, yesterday’s coffee. Or, for all we knew, coffee from another yesterday. Cue Anne and me exchanging our flattest Jim-and-Pam looks. Also cue flashback to me as a clueless teenager (and future coffee drinker) in my earliest fast-food days, in which I learned the hard way (i.e. by one of our regular, elderly, normally kind customers yelling at me) that you can’t simply brew one pot of coffee and serve it for unlimited hours, let alone for days. Coffee is not eternal like Coke or fruitcake. Even your better gas stations know better than that. Heck, some of the best coffee I’ve ever had was at gas stations. Serving someone hours-old coffee is the quickest way to signal that you know absolutely nothing about coffee, should not be trusted to serve coffee, and in fact should delete coffee from your menu and donate your brewer to the nearest church, where I promise it will be put to better and constant use. We weren’t merciless enough to exit such a cozy situation without buying anything, but I knew whatever we bought would be saved for later as snacks, not the breakfast we kind of needed now. I settled for a muffin and a mini-pie. Anne asked about one pile of mystery loaves and was instead handed an unrelated box of scones. Correcting the misunderstanding would have taken extra seconds we no longer felt like spending. Three goods of unknown ages set us back a total of five bucks. To be fair, I can’t call that overcharging. We adjourned to the car and made a beeline for Hilligoss Bakery, where our appetites were sated and I could call “do-over” on my morning. In this post-post-Thankgiving time, I was grateful to have experienced professionals we could rely on in our moment of donut desperation, even if it meant extra mileage. And I was grateful to see small business done right. Later in the evening, I tried that mini-pecan pie. Perhaps it was top-notch in whatever month it was baked, but by this time it was sadly rock-hard. The chocolate muffin, on the other hand, was grade-A delicious and still moist like you’d expect from the kitchen of an accredited grandparent. So the new place has some potential. I’d love to see them survive, thrive, and become the kind of place where we’d love to be regulars. It would almost be walking distance if we were younger and healthier, and if our side of Indianapolis had sidewalks. But the bakery and restaurant businesses have so, so many basics that need to be tended to if you intend to defy the odds and someday become that beloved shop everyone talks about. I’m glad other Nextdoor users had better visits than we did, but I saw too many discouraging hints to write this off as a simple fluke of a bad day. Here’s hoping that I’m wrong, that they achieve their dreams, and that they don’t become fodder for some local crank to use as Exhibit A in his horrible “MILLENNIALS ARE KILLING DONUTS” thinkpiece. Their staff might consider going on a field trip to Hilligoss Bakery and taking lots of notes.